This slate was quarried until the early 1900’s in the Charnwood Forest area, and was used for a lot of the Vale of Belvoir Angel memorials as well as for earlier slates and memorials all around the east midlands. 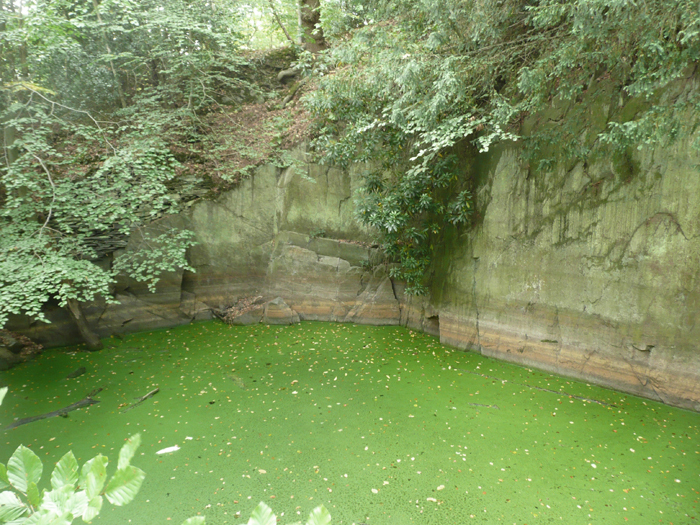 There were several small quarries as far as I can tell and here’s one I found on the outskirts of the village of Swithland. I had hoped to bring a little piece back as a souvenir but it was extremely dangerous……….basically a pit filled with possibly very deep water edged by sheer “cliffs” of slate. The village church has many wonderful slate memorials, some very accomplished pieces of carving and some more crude. The earliest was from 1673.
here are a few examples but there are more on my flickr pages. This entry was posted in lettercutting, old memorials and tagged carved lettering, lettercutting, slate carving, stone lettering, swithand slate. Bookmark the permalink.